We’ve previously written about motorcycle accidents, but we thought it might be worthwhile to share a few more thoughts. If you’re injured in an accident and have to go to trial, it’s important to keep in mind that the jury will determine whether or not you are entitled to compensation and how much you are entitled to receive. While the questions concerning negligence and liability seem like they would require objectivity, juries are composed of everyday people who may not be as objective as we would like. Try as they might, their subjective opinions can color their view of the case. When it comes to motorcycle accidents, these opinions can range from “motorcycles are just plain dangerous” to “motorcyclists are reckless daredevils who shouldn’t be allowed on the roads.” These beliefs are obviously unfair, but we want you to be aware that you may encounter this bias. Not all hope is lost, however. A skilled attorney should be able to submit evidence to counteract this bias such as your driving record and experience as a motorcyclist. The contributory negligence rule applies in every personal injury case, not just motorcycle accidents. However, due to some juror’s negative perceptions of motorcyclists, this can lead to the rule being applied where there was no contributory negligence or an exaggeration of the role the motorcyclist’s negligence played in the accident. If you’ve been injured in a motorcycle accident, a personal injury attorney can help you determine what your claim is worth. More importantly, she can help you identify any potential issues, such as whether you were contributorily negligent. Even if you were negligent, it’s important to understand that you are still entitled to fair compensation. Mounting a camera to your bike or your helmet can really help you make your case if you’re in an accident. The police, your insurance company, and your lawyer can use the footage captured by your camera to prove that the other party was at fault and therefore should be held liable. You can also use a software add-on to display your speed on camera, which can be helpful in demonstrating that you were not contributorily negligent. If you’ve been in an accident and don’t have a camera, don’t worry – an experienced personal injury attorney can still make your case. The most important thing you can do is to document all the information you have surrounding the accident, such as traffic and weather conditions, how fast you were going, and exactly what you saw before the accident. 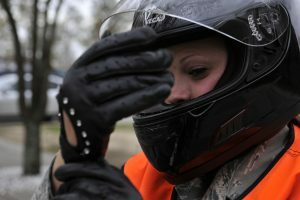 Motorcycle accidents are in many ways just like car accidents but are also unique. If you’ve been injured in a motorcycle accident, you need a lawyer who understands how motorcycle accidents are different and what steps need to be taken in order for you to get the compensation you deserve. The attorneys at Slappey & Sadd help injured motorcyclist in the Atlanta metro area and across the state of Georgia, and we can help you. If you would like a free consultation, call us at 404-255-6677 or email us via our online contact form.